Again, trusty 'ol Gus was eager for the 11 miler this morning with Mel and Kerrie...totally located a satellite like a pro. :) He also was the only Garmin that was turned back on after some brief water stop pauses. Heh heh. Everyone wanted his stats! Actually, not everyone, but a couple people forgot to hit the "resume" button. Super Gus! This Saturday long run was very similar to the run two weeks ago when I first became a Ninja Running Bandit on the trail with Mel and her training group. This means that Kerrie and I were running a little late and I had to speed/sprint my way past all the other training peeps and try to catch up to Amazon Tall Mom Mel. EEK! A couple times I looked at Gus and saw numbers that started in 7. Like 7:45 and 7:52. Oh goodness, how far ahead was she? Let's just say that after 2.5 miles I had to yell "MEL!" when I seriously could not go the last 100 feet to catch up. I was dying. Luckily she heard me and slowed down, but after saying our "hellos" she said something that made me see stars: "We're going a different route today: It's got more hills." Excuse me? Did you mention the H word in that sentence? Besides race pics, this is the first time I've had my picture taken on a training run. Ah yes, felt like a rockstar. The rest of the miles flew by with fun conversation and laughter. It was a successful 11 miles! Unfortunately, there was no Sam the Eagle sightings today. *sigh* Apparently that date he had a few weeks ago must've been major because he's been spending all the time with her. Geez, bros before ho's, Sam. Thank you Mel and Kerrie! The Ninja Running Bandit strikes again! Mwa ha ha ha! Nice run! Looks like it was the perfect day for a long run and nice that you have running mates! You ladies are too cute! Great run and I love the pics! Way to save the day, Gus! Awesome pictures! Sounds like a great run - so much better than mine on the treadmill! Yay for group runs with friends. Nice pictures! 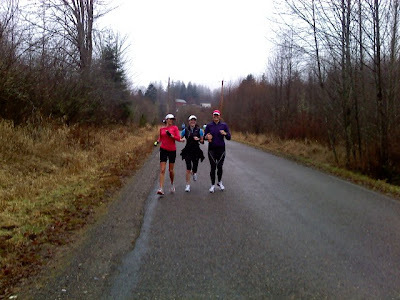 Looks like a great day for a long run - except for those jackets! Thanks for the stats!! I am sooo bummed I forgot. YOu rock so much for catching up to me... I love my ninja bandit. did you see Janna is on Dailymile? I think it's so awesome that y'all have each other to run with!! You ladies look like you're having a great time. Way to go! 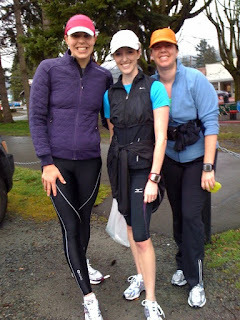 You guys make me wanna move to Washington just to have an awesome running group! Good job. 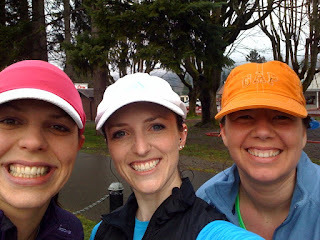 Love your and Tall Mom's pics during runs. I often forget to reset before a new run or resume after a break. That makes me so mad. Love also that you named yours. Too cute. Way to hang in on the hills. Sounds like a great run!!!! Wish I could have made it out! One of these days I will!!! Good job on Catching Mel!! That would have been the end of my run. 2.5 in 14 min. Done and Done.